or for assistance, call toll free 1-800-791-7144. 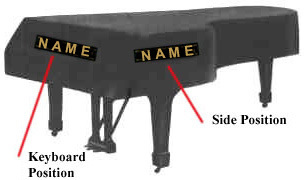 If you don't see your model number listed below,measure the entire length of your piano, from in front of the keys to the furthest point at the back curve. Note: - Measure underneath the piano - it's easier. We can also make the length of your cover to go to the floor. Custom Made $90.00 extra. Custom Made Covers at No extra charge. For assistance call toll free 1-800-791-7144. Click each link below for Fabric descriptions. Not all Vinyl is the same. Some vinyl covers we've seen are paper thin or look like plastic. 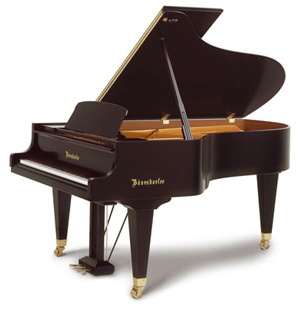 Our Vinyl is the correct weight for piano covers. Not paper thin and certainly not heavy duty. Not to mention the hassle of getting it on & off the piano. The cover for my Bosendorfer grand arrived today, couldnâ€™t be happier with the fit, material & quality. Iâ€™ve been looking for a suitable cover in Sydney Australia for several months after the lid suffered some serious damage & cost a lot to fix. All I could find locally were flimsy frilly covers for not much less. Lastly, great service, I was able to track its progress. We're quite happy with the new cover which we received today. It fits well on our model 200 6' 7" piano from the late 1950's (slightly on the larger side). We opted for the quilted padded Mackintosh and the quality of this fabric and stitching is very nice and should offer very good protection. The embroidered Bösendorfer logo looks perfect! We'd recommend this cover without hesitation. A custom full-length 214 cover with flaps. Arrived within 7 days. Material is thick but soft underneath and tough (soft jean like) outside and perfect fit. Feels and looks high quality, will easily last 10+ years with careful daily use. Simple vacuum topside to keep clean. No dust inside if piano top is clean and cover is folded carefully during removal. Very satisfied. We've made several purchase from Vandaking.com, the latest being a padded piano cover for our Bösendorfer Imperial. We are extremely pleased with the cover. It was nicely embroidered with the Bösendorfer name. Now, our cats can jump on the piano without us freaking out! My wife was delighted to receive a great piano-cover for christmas this year and it puts her mind at ease with our children's activities around the piano. It covers well, fits perfectly and looks great with embroideries!